As promised....I wanted to share more of what inspired my new Primitive Threads fabric collection and more of the prints in the line that I hope you'll be asking for at your local quilt shop. 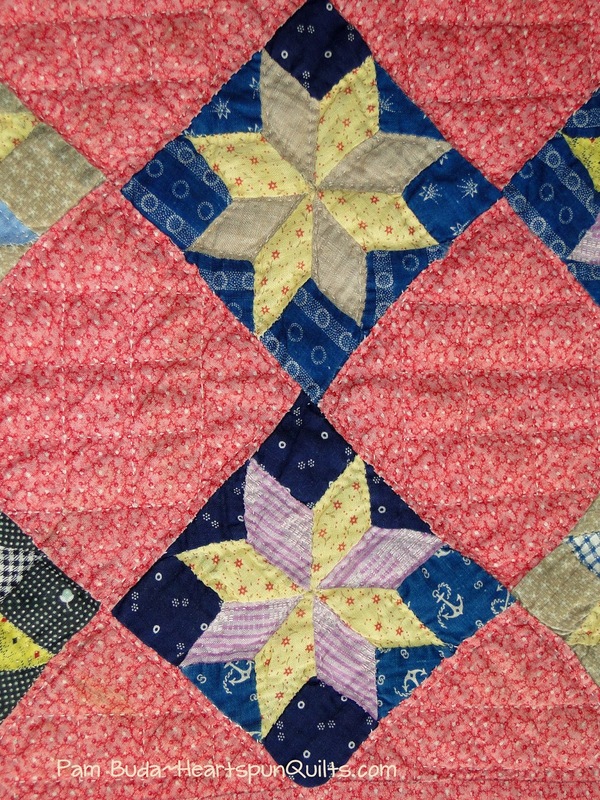 One of the perks of fabric designing is having a collection of antique quilts and this one sure is a cutie! 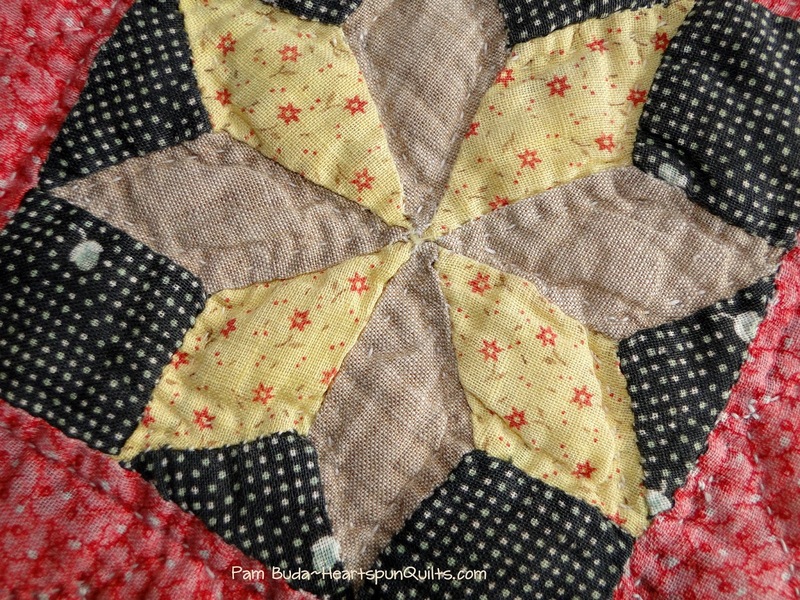 A closer inspection of the patchwork reveals this super cute little star flower....perfect for Primitive Threads! 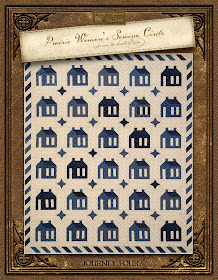 This little print is made in three colors....a neutral, a brown and blue multi-color print. So super sweet! (Truth is...I would have loved it in every color!!) I call this print Star Flower Toss. 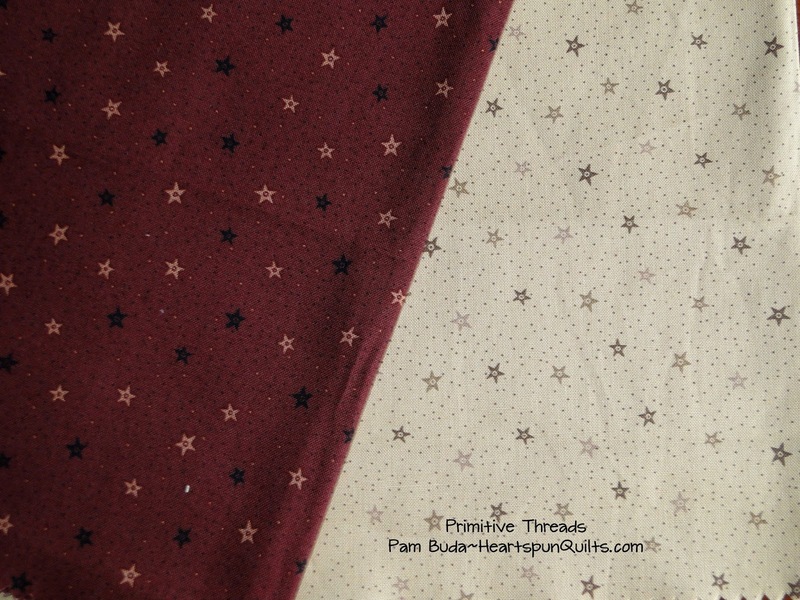 I hope you have enjoyed seeing a little of the fabric design process in these two posts about Primitive Threads and you like what you see!! My sample fabrics will arrive soon and I'll post some sewing progress while making the quilt. Watch Facebook and Instagram for some photos, too. 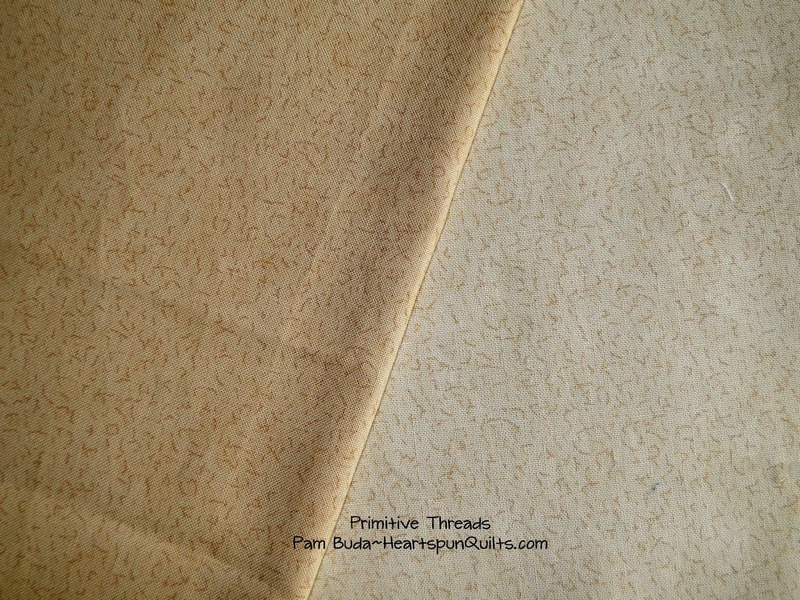 Primitive Threads should arrive at your LQS in April!! Click here to see all of the Primitive Threads fabrics. Counting the days until Spring arrives!! Be well.....stitch happy. First Peek At Primitive Threads! 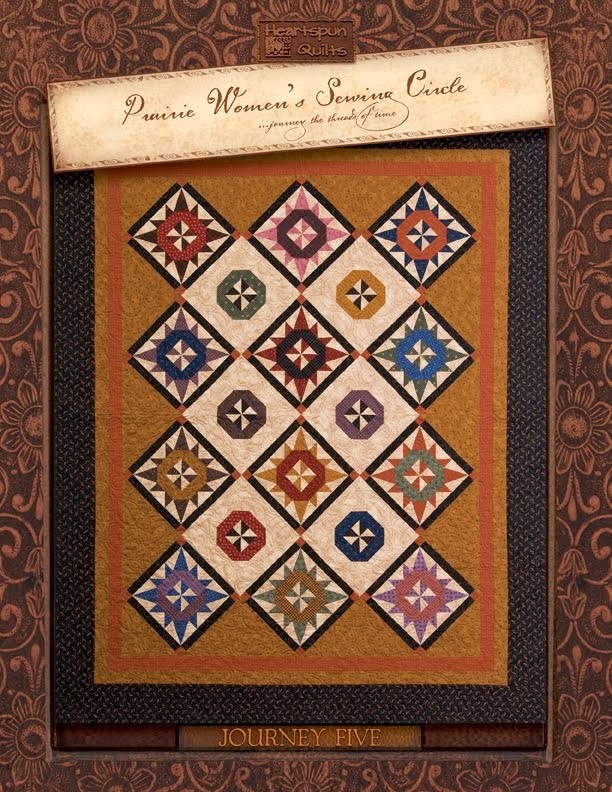 Introducing my Primitive Threads quilt! Boy...this feels so good!! I tell ya....working in secret is hard sometimes, so when it's finally time to share....I can hardly contain myself! When choosing fabrics for a primitive collection, I knew I wanted darker, muted colors....prints that had a folk art feel to them, and absolutely had to have some stars! What's primitive without stars?? I also wanted the prints to fit in nicely with other historic prints. So....let's take a look at some of the Primitive Threads fabrics and the antique fabrics that inspired them. 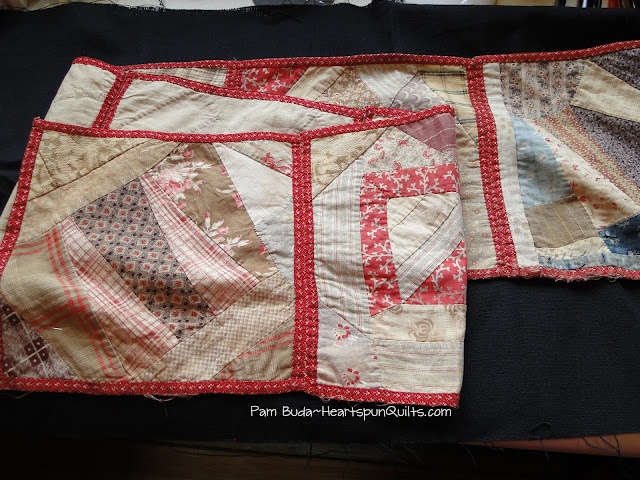 Several years ago, I acquired parts of a potholder quilt. Just holding it is so sweet and dear. I have several long pieces with six blocks, a couple of twin blocks and some single blocks...all with the same red binding print. I'm not sure how old they are. I think the fabrics in the blocks may be older than the binding, but I'm not sure. All I know is.... they're old! This brown print has been one of my favorites since I've owned these historic pieces, and I thought it fit into the folk art theme I was going for. I just love the whimsical feel of the flowers. 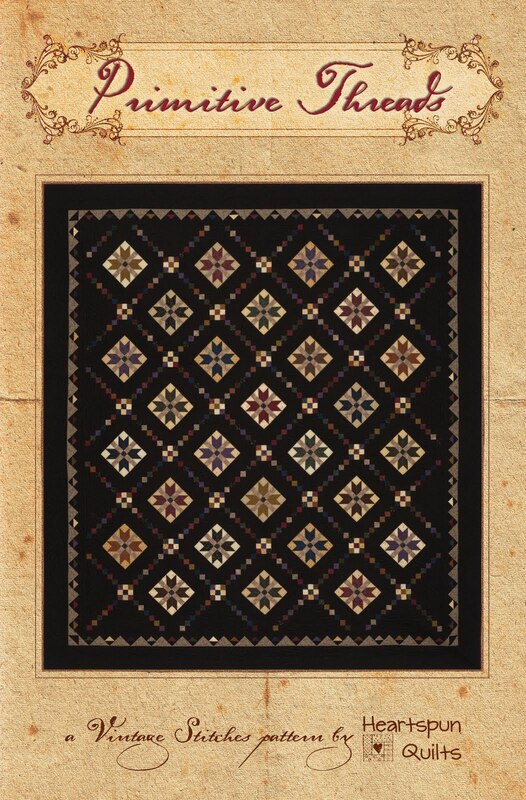 It was the perfect choice for the main black background print of the quilt I designed because that print needs to read as a 'solid', and could not have any direction to the pattern. Yet...I didn't want a true solid....I wanted something more fun and interesting. It was perfect! It turned out so great, we printed it in four colors. 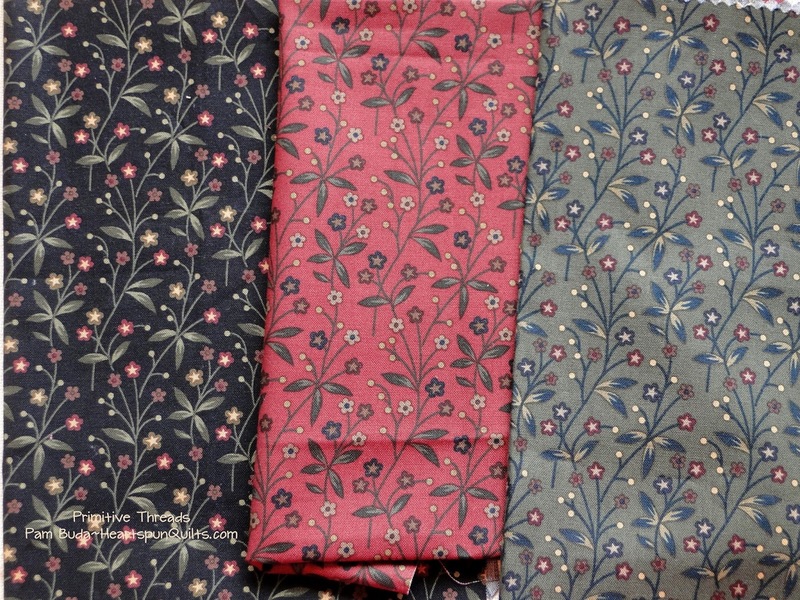 For the black version, the actual floral print is in a soft brown so it will be seen just a bit, but doesn't change the overall color of the black fabric. 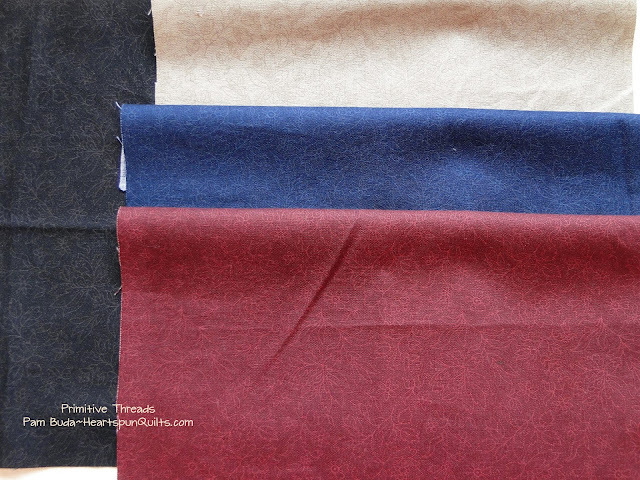 The red is actually a darker cranberry color, blue is a navy and the light is a soft warm beige. The red, blue and beige are all tone on tone and are much prettier than this photo makes them to be. (You know me and my camera....sigh....so hard to capture what the colors really are!!) This print is called Folk Art Flower. 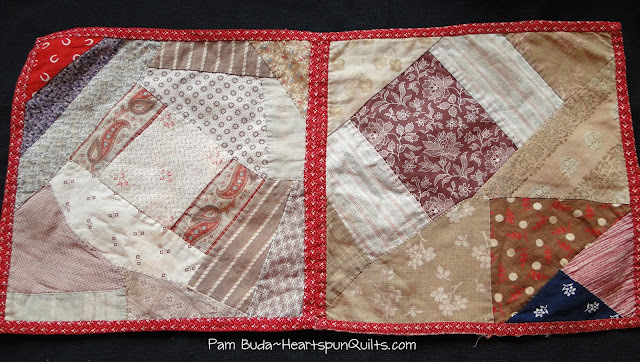 I used another print in the potholder quilt that I am just wild over!! It's so faded, but you hope you can see how sweet the little star flowers are. It just screamed folky and primitive to me! Here's how that sweet print turned out! I LOVE IT!!! Honestly....please see these fabrics at your local quilt shop. My photos just don't do them justice. This print is called Folk Art Garden. I thought I'd add this photo of the back of the potholder pieces for those of you who like to study old quilts. The blocks do not have any batting in them, and the quilting is just along the edges of the crazy piecing. I think it's just precious. 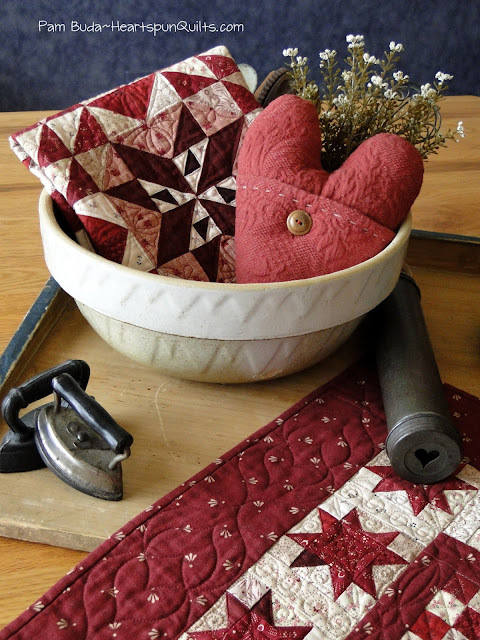 Any guesses how old the potholder quilt pieces are?? 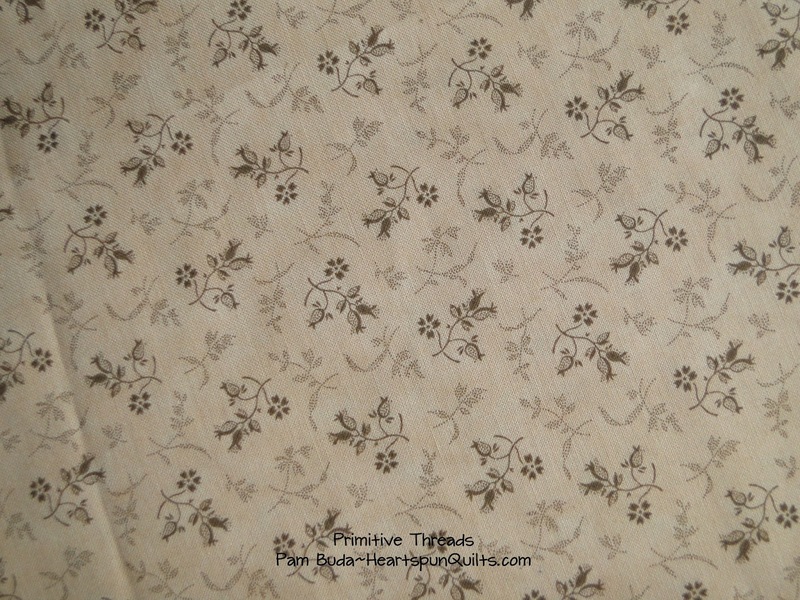 I'll show you more Primitive Threads fabrics and their antique fabric inspirations in my next post. Hope you like what you see so far. 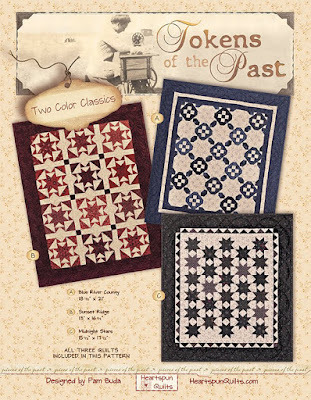 Primitive Threads fabrics should be arriving to your local quilt shop in April....so please....be sure to ask for them there. It's so very important that we support our quilt shops!! 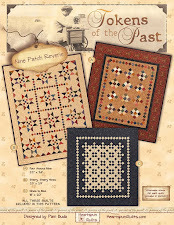 When, in my last post, I hinted that my next fabric collection was something kinda new for me, did you think primitive? Yes!! 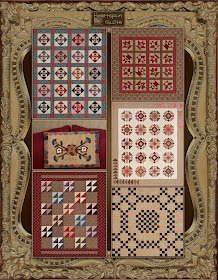 Primitive Threads is my next collection for Marcus Fabrics!! Actually, primitive is not out of character for me at all when you know from where the inspiration for the collection came. Antiquing is one of my passions with emphasis toward nineteenth century antiques. I have several antique shows I attend where all items for sale are from the eighteenth and nineteenth century. I thoroughly enjoy admiring the hand-crafted workmanship of the antiques as most of them are handmade. Our early American ancestors were big time "Makers". The book above is a favorite of mine. American Country is a series of books published in the 1990's by Time-Life publications. (I've found the books at antique shows and shops, and on eBay.) 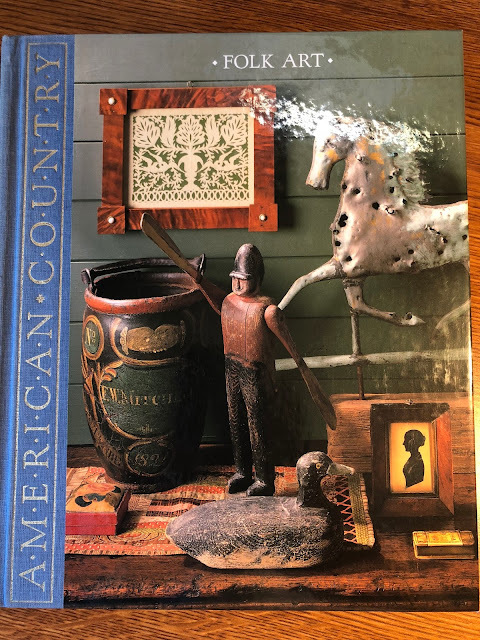 This one is all about American folk art and I just love browsing the pages. 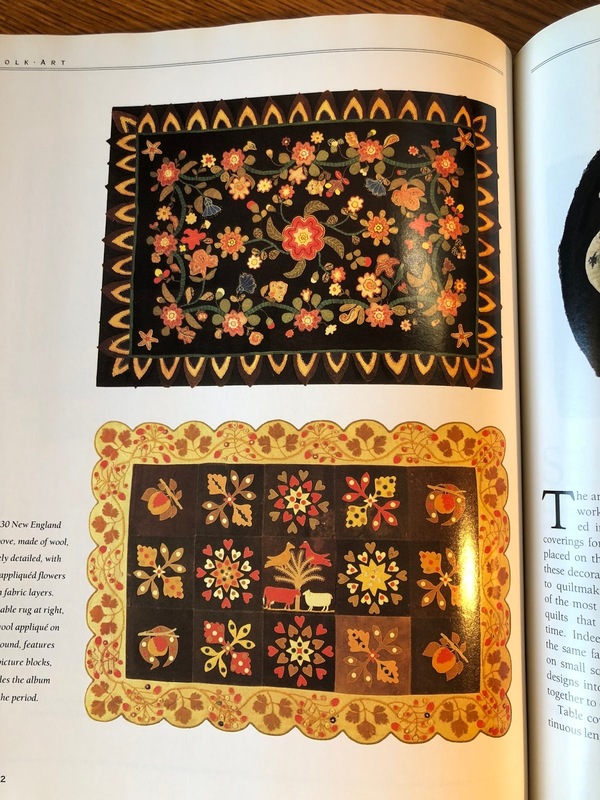 The cover is a lovely collection of hand made and hand painted items of true Folk Art. The colors are dark but soft and warm. I'm smitten! 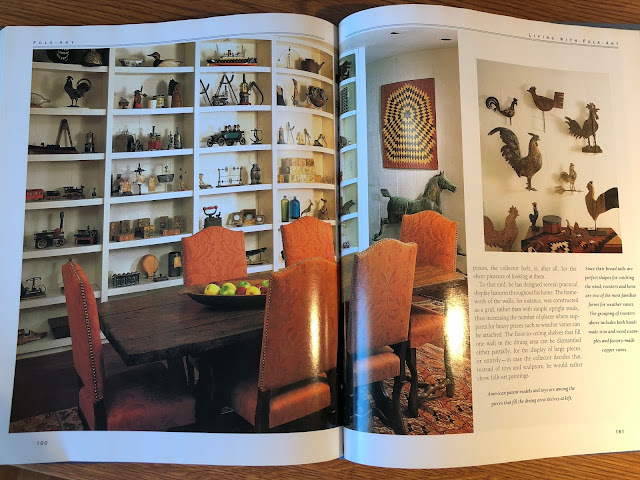 Among the many items showcased in the book are hooked rugs. The designs and the colors speak to me. Oh....to own one of these beauties!! I'll have to admire and not acquire!! 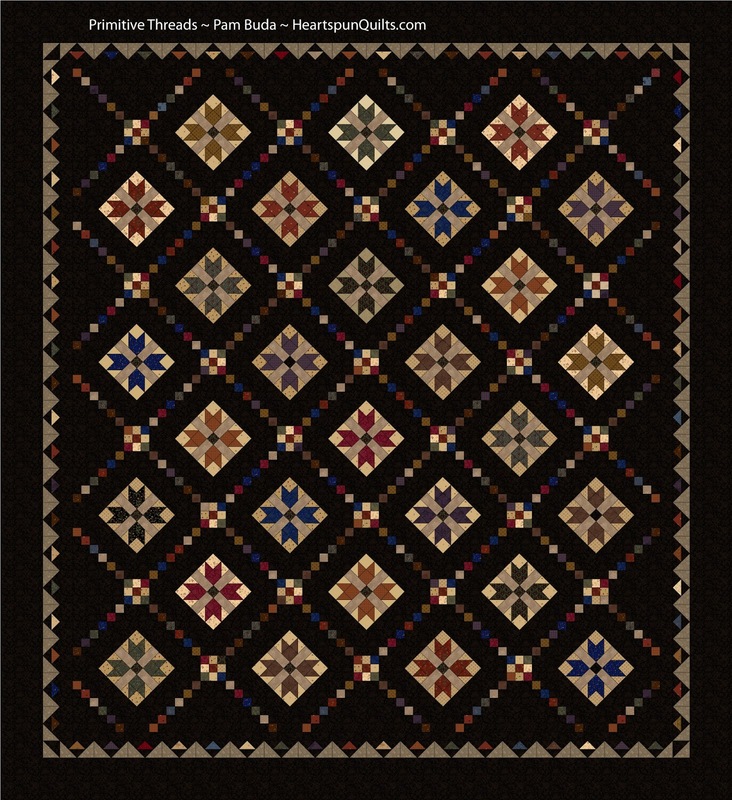 Of course quilts are a huge part of folk art....as is the color black. Black seems to be the perfect neutral to show off all other colors. Even if you're not as fond of black as I am, a little black in a room really sets things off. Like the book's cover photo, this photo of shelves of folk art sums the look perfectly. I am fortunate to own a few true handmade pieces of American folk art....treasures to be sure. I am smitten with the makers desire to create beautiful things from ordinary everyday items. They dipped brushes in paint, carved wood, cut paper and put needle and thread to work to make a truly unique class of art, although I don't believe they thought of it as art the same we do now. 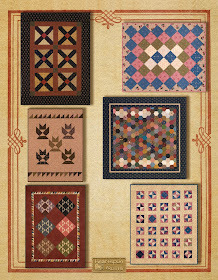 Items such as nineteenth century game boards, whirlygigs, Tole and Fraktur painting, wood carved and painted toys and banks, Sgraffito pottery, painted furniture, samplers, homemade dolls and pieced and pictorial quilts all serve as inspiration for this new primitive collection. 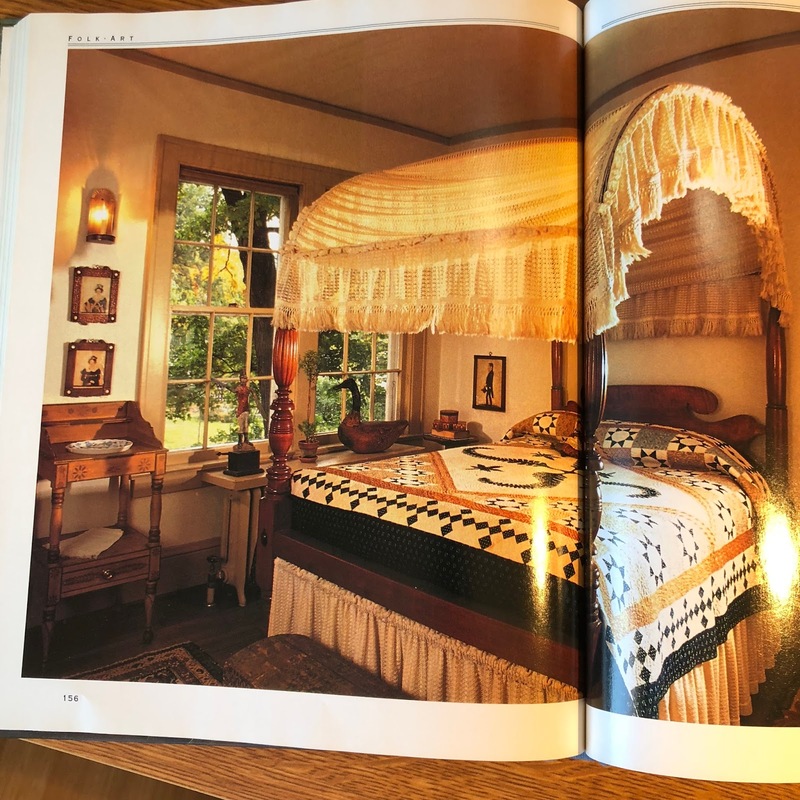 In my next post, I'll show you the fabrics in the collection and some of the original nineteenth century antique fabric prints that I chose to replicate. I'll also share the quilt I designed featuring the entire collection. I'm so jazzed for you to see it!! In the mean time, you can click here to visit the Marcus Fabrics website for a sneak peek at the fabrics!! I am very happy to honor our American Folk Art heritage with the Primitive Threads collection! 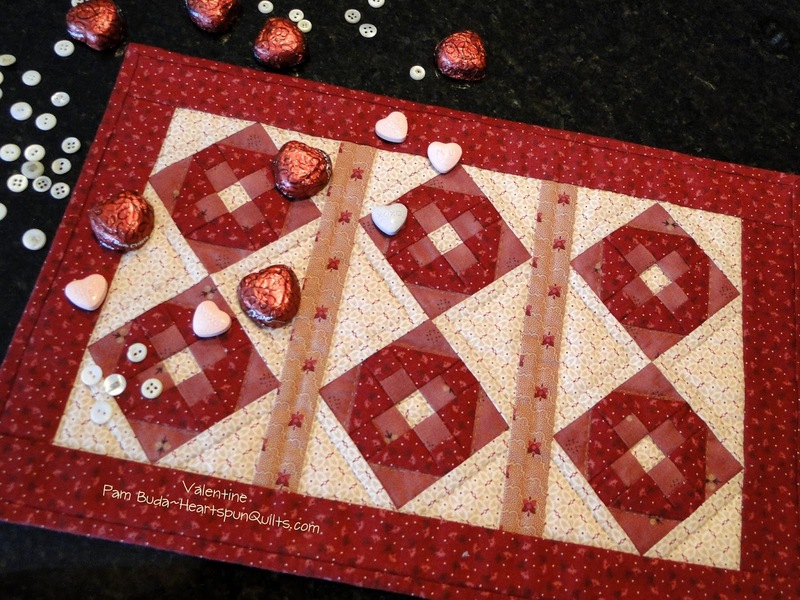 Have you been able to piece your little Valentine quilt? Time has passed so quickly! Wasn't it just New Years?? Ugh! So many quilts.....so little time. While we're still on the subject of working with tiny pieces, I thought you might like to read a blog post from a fellow quilter who received the little Valentine kit above and had never worked with such small pieces. I found it very inspiring! Click here to read. Enjoy this day with those you love! It was such fun reading all of your comments telling of the many rewards and perils of piecing tiny blocks. What is the smallest size Four Patch you are willing to make? Amazing isn't it?!! Seems those of us who love tiny are in the majority! Or...it was the majority of tiny piece quiltmakers who took part in the poll. Anyway...we're in good company! If you have a chance, grab a cup of coffee and read the comments to my last post. You are all so funny, gracious and generous to share your experiences. You really make my day! 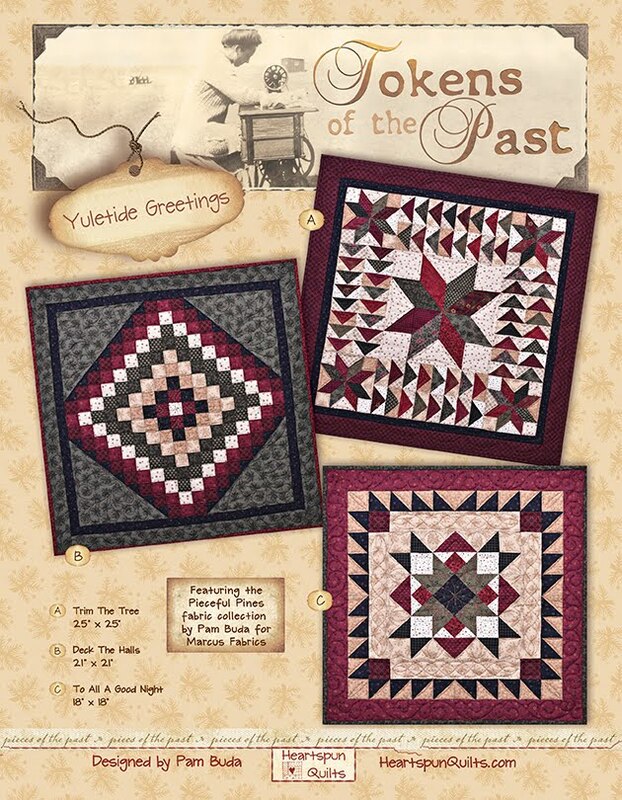 I am also awed and inspired at how many of you are comfortable piecing units and blocks finishing less than 1 inch!!! WOWSERS!!! I must try that as well...even if I only make a bunch of Four Patches. I'd like to thank all of you for taking the time to leave a comment. I appreciate it so very much. I chose three winners who will receive a copy of my Tokens of the Past: Two Color Classics pattern, featuring three quilts with small blocks finishing to 2, 2.5 and 3 inches. 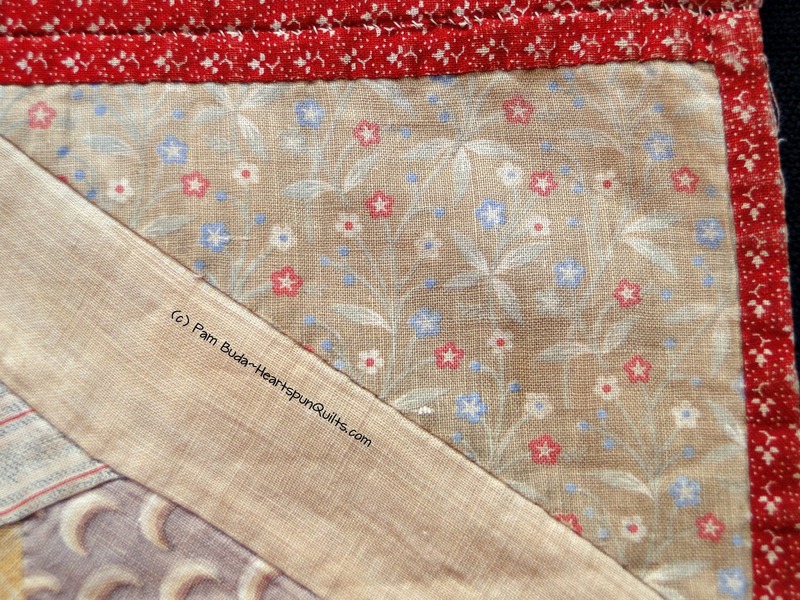 I am working on way too many projects- quilts,bags, wallets......Need I say more? 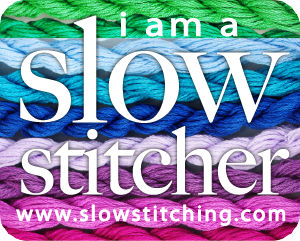 I love,love,love scrappy projects but the smallest 4 patch that I am willing to make is 1". The smallest hst that I will make is 1/2". I don't enjoy paper piecing at all but if you make blocks smaller than 1/2", the seam allowance is just ridiculous to deal with. My favorite sewing projects are small quilts. 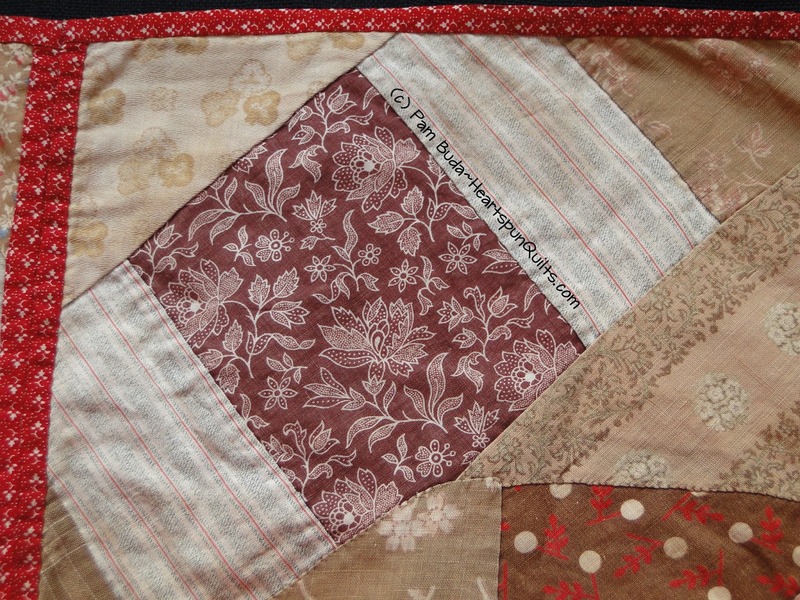 I piece on the Featherweight and then hand quilt them. I make for the holidays and for gifts for friends and family. I am always looking for the next project(s) as usually I have more than 1 going at the same time. I will use one inch pieces. I love your quilts, fabrics and patterns. Thanks! 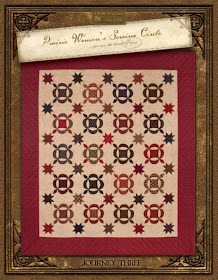 Love your mini 9-patch quilt and I'm looking forward to the reveal of your super secret scrappy project when it's time! I've never made anything as small as your 1.5" finished blocks, but it would be fun to try a 2" finished block. I do better when I can focus on one project at a time (otherwise nothing gets finished!). I admire you multi-taskers! Thanks for a chance to win one of your patterns. 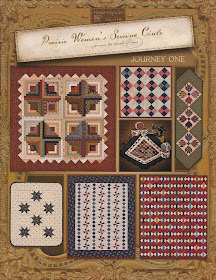 Speaking of piecing very tiny blocks and making very small quilts, you may really enjoy reading my friend Janet's blog. 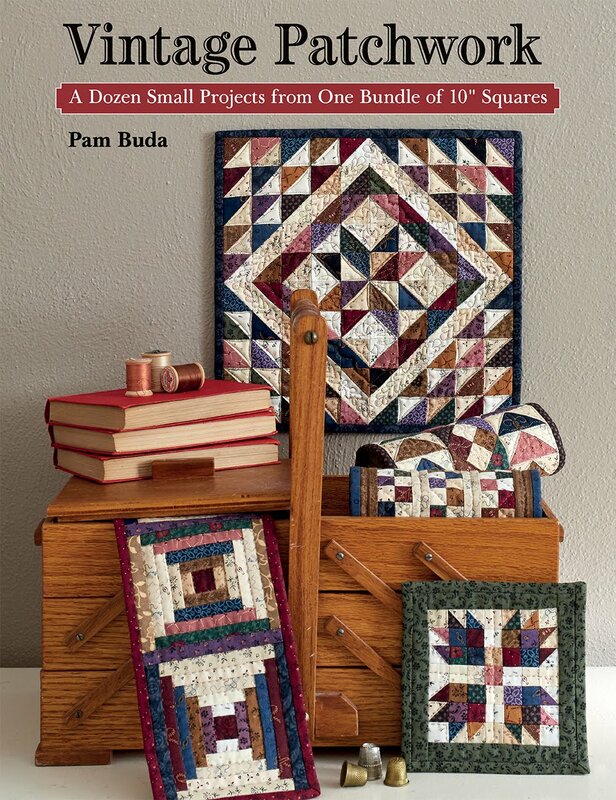 She is very experienced and talented at working with tiny pieces and very recently wrote an excellent blog post all about how to bind a small quilt with single fold binding. Very informative and helpful! Click here to read Janet's blog. 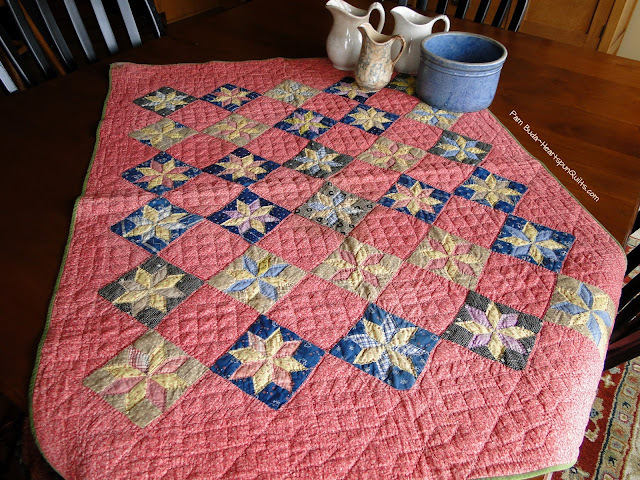 While you're there, scroll through past blog posts for loads of photos and inspiration of the many, many small quilts Janet has made. You'll find a lot of her work on Pinterest. 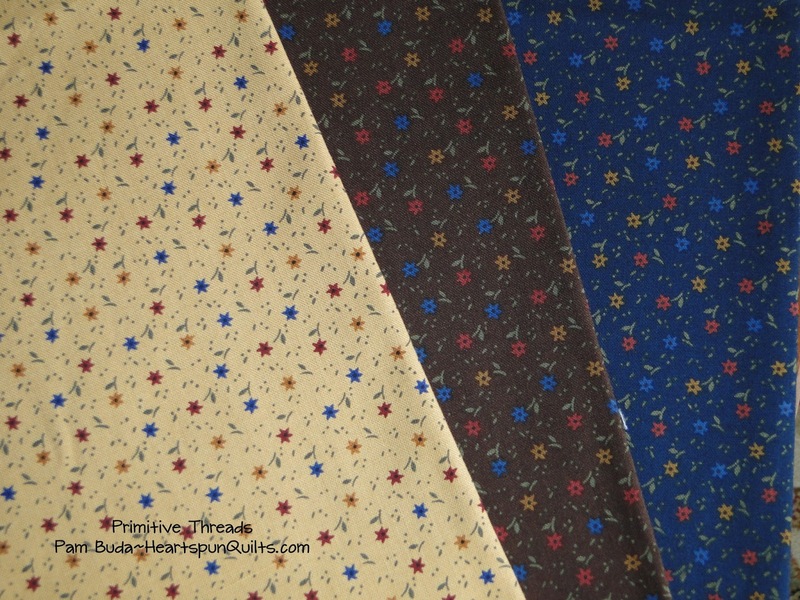 Later this week....I'll be sharing news and photos of my next fabric line. It's a bit different and something new from me! I can hardly wait to share!! Tiny Nine Patch Quilt Finished! A few weeks ago, I posted a photo of this little Nine Patch quilt when I completed the top. Now that it's back from being quilted, I wanted to share a photo of the finished quilt. I love it!! 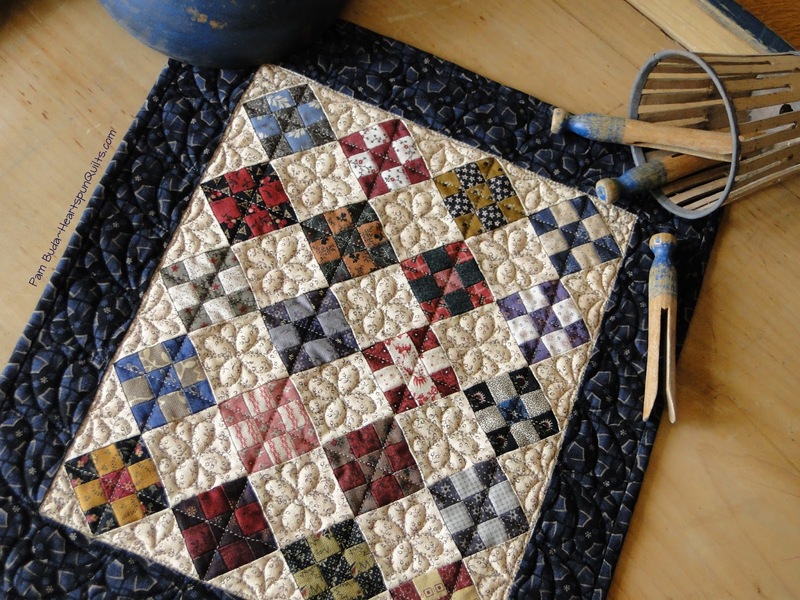 There's something just so wonderful about scrappy quilts. I love the process of digging through my scraps to find just the right fabrics to pair together. We all have those prints that are our favorites and I'm no exception. Seems those favorite fabrics make it into every scrap quilt I make! Do you find you do that, too? That's our love, if not obsession, with fabric, and why we never have too much of it! Presently, along with working on my super secret scrappy project early every morning, I'm also cutting and sometimes piecing the parts of five other scrap quilts at the same time. Because scrappy is so labor intensive, I am making the most of the opportunity when I choose, starch and cut each piece. Why dig through your scraps and stash again and again? So, with that in mind, I have a little list of what to cut for each quilt. I must be organized and make the best use of my precious sewing time. More on this subject when the super scrappy secret project is revealed later this year. 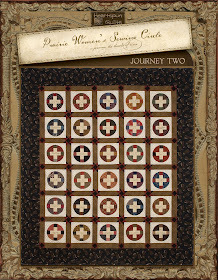 The Nine Patch blocks in the quilt above finish to 1.5 inches. 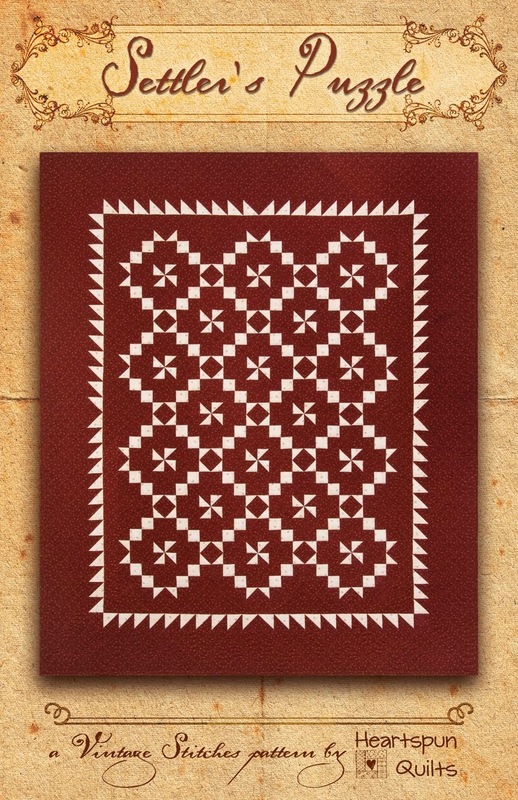 My next teeny, tiny quilt will be a simple Four Patch, with blocks finishing to 1 inch!! That has me wondering....what is the smallest Four Patch block you are willing to make? Notice I didn't say "comfortable" making....I know bigger is more comfy. 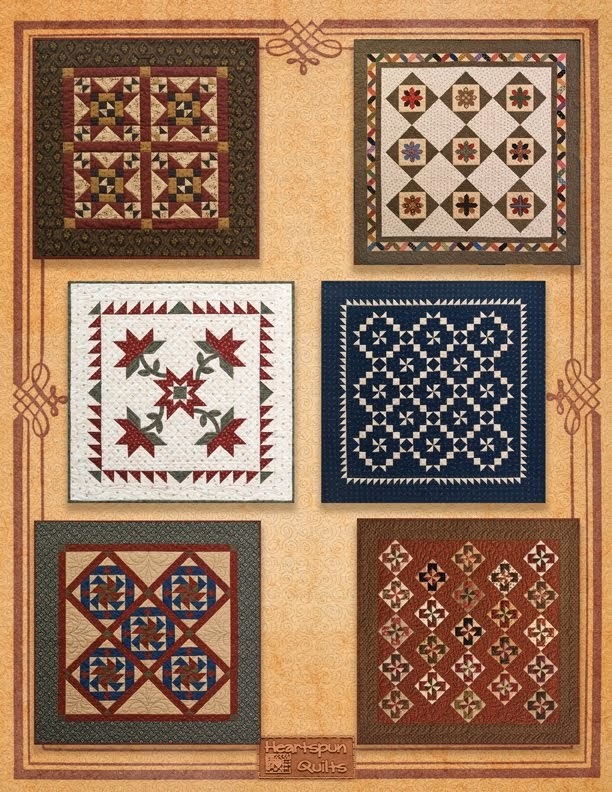 So, I want to know if you set out to make a little scrappy Four Patch quilt, what is the smallest size finished Four Patch you will make? 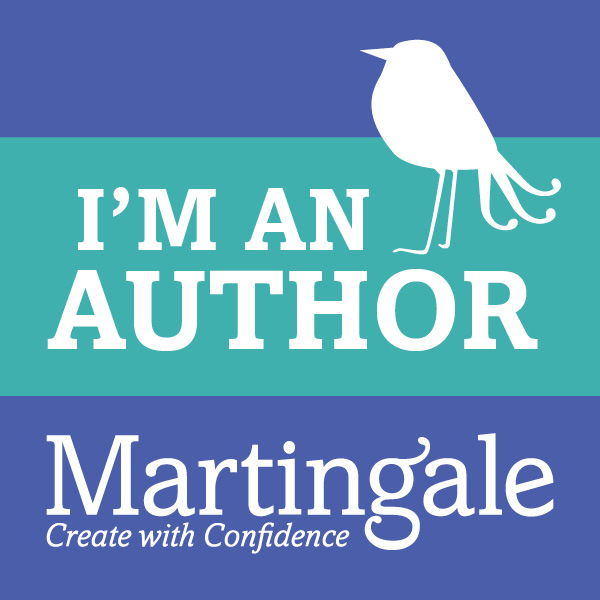 I have a poll on the side bar of my blog where you can cast your vote....and please do! It will be fun to see the stats. Click here to see the poll. 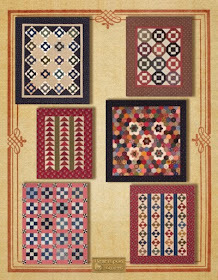 pattern, which features small blocks from 2 inches to 3 inches finished, FREE! Friends reading this post living outside of the US are welcome to comment as well. I'll choose a winner or two over the weekend. Off to dive into more scraps!